In the last edition Paul wrote about why CCR is safer, deeper. You may recall Paul talking about a dive to 100m which didn’t go according to plan and where some rather hair-raising minutes were had... Trust me he wasn’t kidding, I was there. to safely get to the surface. A key learning, as Paul mentioned, was how CCR brings an additional safety aspect to a dive to those depths. Now I’d like to share some additional thoughts and learning from that dive. Looking back not just to that dive, but over my diving career, there are two things that have become so much more important and obvious to me as a diver and as an instructor since that dive. Firstly - preparation. by having a cup of tea and a chat about what weird and wonderful things we might see once we are under water? i.e. haven’t we all done dives without any real preparation? Proper preparation means knowing your kit like the back of your hand, that you know where it all is, so you don’t have to make a last minute dash back to the shop to pick up an under suit because you have forgotten it. buddy or team member in a worst case scenario, be that at 5, 50 or 150m. This includes reviewing signals so you can share information underwater, knowing where to find their back up mask and other things so you can help them if assistance is needed. the deep qualifying dives 100%. You may need a crash course in CCR dos and don’ts, but that is well worth the investment. When you enter the world of tech diving you already have a significant amount of dives under your belt, you are a responsible consenting adult and hopefully you will agree that having additional breathable delicious air at your disposal in an hour of need is a beautiful thing. Preparation means knowing your dive plan. With technical diving the planning requires significantly more time than recreational diving. Hop in, swim around and come up just won’t do. the pub. It is your ticket to the after dive margarita, pint or whatever your preferred drink is. You don’t have to experience a catastrophic gas failure to be in a spot of bother at depth. Something which at the surface seems trivial is enough for you to look at your backups. Knowing the options based on the gas you and your team carry with you is your route to safety. Preparation is mental preparation. I know that meditation ￼￼￼and visualisation may not sound like your cup of tea. And no, you don’t have to sit in double lotus chanting. But taking the time to walk yourself through the dive, to think through each gas switch and making sure that you are comfortable with what you are about to do is a well worthwhile investment. If you feel that something isn’t right then this is your chance to speak up, to work it through and find a solution before you hit the water. Safety is the name of the game and you have responsibility to yourself and your buddies to be the best and most prepared diver you can be on the dive. A diver we all want to dive with and who we trust. This leads me to the second point. Trust with a capital T. Trust in yourself, trust in your buddy and trust in your instructor. and some of the things your instructor asks you to do may seem odd and outright dangerous. As instructors we create an environment of trust and our students should trust that we teach them the right behaviours and attitude around diving. The cert card is our stamp that we trust their abilities as a diver. 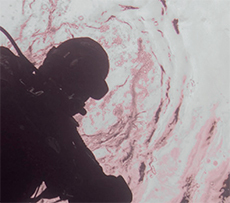 In technical diving the stakes are so much higher and mastery of shutdowns and other skills are an absolute must-have to ensure we can remain safe. If my instructor says, “Not good enough, repeat the skill”, I trust that he is doing that to make sure that I am ready and prepared. with clear water and pretty fishes all around I recall my instructor choosing to not enter the water for some of my dives. Looking back, without seeing me doing a skill or answering a question, could he trust that I could do what was expected? Do I trust him? Not so much. member. He would not have let me near the water had he not believed that I was capable of dealing with the situation and the risks that going to 100m carries with it. As a diver, starting your technical training means that you have trust in your own abilities. With each skill and each dive you do. This trust and belief in yourself grows and strengthens. You have taken on a new challenge and trust that you are ready for it. A trustworthy instructor can and will tell the student when they are not ready for the next step. As a student, it may bruise your ego but it will make you a stronger and better diver and a more trustworthy buddy in the long run. I firmly believe that it is all down to the hours spent practising skills, talking about safety aspects and theory and planning the dives we all came up in one piece after that dive. We had planned the dive as well as we could and when something went wrong, we worked together as a well prepared and trusting team to get to the surface. Sure, having the CCR there with the extra buffer of breathable gas would have been great but I believe that the preparation and trusting each other is even more important. Angelica Asplund was diving with Paul Toomer. Paul is Director of Technical Training for SSI (Scuba Schools International). He owns Diving Matrix Tec Lab with facilities in London, Manchester, Red Sea and Malta.